I’m sorry we didn’t get to talk. Yeah, I was gruff when you telephoned. I get a lot of cold calls from folks trying to sell me stuff and take my money, and I usually hang up or act bored or hostile when I get these calls. So when you said “well, I’m Jim from Police Lives Matter, and I guess you’re in a bad mood and don’t want to talk,” I reflexively said “well, this is not a good time,” and you said thank you and hung up. I regret having cut you short – I really wanted to talk to you. 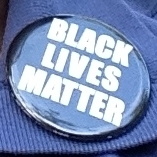 Did you know that I walk around town wearing a Black Lives Matter button? I picked it up from my church. A year or so ago, I called the local police to praise the conduct of one of yours, and I was treated very kindly and with gratitude until I revealed that I support Black Lives Matter, whereupon the Public Relations person turned icy and abruptly cut off the conversation. So I wonder if you would have hung up on me over my button. When a 12 year old kid is fiddling around with a toy gun in the middle of a basically empty park (the video shows this) in Cleveland and a squad car speeds up to him and, within 2 seconds, the officers inside shoot him dead, there is a problem with Black Lives Mattering. Don’t argue the facts with me – I watched the video. All of it, mind-numbingly long and mostly static, showing the virtually empty park and the solitary, passively loitering kid, leading up to and including the shooting. When his anguished sister then runs at the officers screaming and crying, and officers throw her violently to the ground, cuff her, and throw her in the back of the squad car, there is a problem with Black Lives Mattering. Her brother had just been killed. They should have thrown their arms around her and hugged her. When an unarmed African immigrant standing on his stoop in New York City, minding his own business, is somehow seen as a threat and police shoot him 41 times, there is a problem with Black Lives Mattering. Perhaps his beeper was mistaken for a weapon, and maybe there was a language barrier. But in an age when everyone carries cell phones (yep, they had ‘em in 1999 when this happened) and carrying a weapon is constitutionally protected and we have an international population, it should not be possible to suffer summary execution for carrying a cellphone-sized object and not speaking good English. When officers put a man into a chokehold, a maneuver prohibited by police regulations, for allegedly selling cigarettes illegally, and is choked to death, and a grand jury fails to even indict the officers who killed him, there is a problem with Black Lives Mattering. And when an unarmed caregiver is trying to manage his agitated autistic client, and the police come along; and, instead of asking the caregiver what the problem is or rendering assistance, they shoot him; and when the caregiver, bleeding on the ground, asks the officer who fired, “sir, why did you shoot me,” and the officer says, with a deer-in-the-headlights expression, that he doesn’t know, there is, for sure, a problem with Black Lives Mattering. Need I go on? There are enough examples to fill a book, but whatever the statistical incidence, the lives of these dead were extinguished without cause or due process. Their lives were cheap, expendible. Mothers (did I mention that I’m a mother?) hear about these deaths, and then they look at their own black children getting ready to leave the house and wonder if they will commit some minor transgression, or just look “suspicious” to somebody, and then come home in a body bag. Police-Lives-Matter Guy, if you’re a dad, put yourself in the place of these mothers. But Black Lives Matter is about far more than police misconduct. It’s about how black folks make less for the same work. It’s about second-class treatment given black patients by the medical community, and about the health disparities, statistically speaking, between blacks and whites. It’s about the high violent crime victimization rate suffered by black people, which far exceeds that of other races and ethnicities. It’s about white perps being viewed as “mentally ill” and black perps as “thugs.” It’s about the persistence of racial discrimination in housing and enormous disparities in family wealth, making black families highly vulnerable to economic crises. It’s about the criminalization of misbehaving black kids in school, the so-called “school-to-prison pipeline.” It’s about the shocking conditions in some neighborhoods and schools, which, if it was occurring in white neighborhoods, would lead to moonshot-levels investment and attention. It’s about all the compassionate attention now being given the opioid epidemic, while analogous addiction problems in black communities just get a criminalize-them response and a shrug. So, Police-Lives-Matter Guy, please stop feeling persecuted. This isn’t all about you. Black Lives Matter, the movement, is about emphasis. As director of the UN Office of the Unitarian Universalist Association, Bruce Knotts, once said: “When the fire department comes to your neighborhood, do you send the firefighters to all the houses or to the house that is on fire? For over 500 years, the house of the people of African descent has been on fire.” It’s long past time to send the fire trucks. Perhaps you would say that you joined the force to provide a public service, and I honor that, too. But you chose this work. You can un-choose it. Black folks don’t have a choice about living lives of vulnerability and danger. When I wear my Black Lives Matter button, it’s a reminder of that risk. But I’m white — I can take off my button, and with it goes the risk of it provoking a confrontation, or worse. I have a choice. Police-Lives-Matter Guy, if there are things we can do to make your job less dangerous, that don’t include treating black (or other) lives as cheap or expendable or violating folks’ constitutional rights, I’m ready to hear them. If your house is also burning, let’s talk about putting your fire out. My empathy is not limited that way. But don’t ask me to remove my Black Lives Matter button. Better yet, come to our church, and learn more about why, in faith to our principles, we support this movement. We have buttons aplenty to share with you, when you’re ready. Mr. Police-Lives-Matter Guy, please join us. We need you. According to the Bureau of Labor Standards, in 2015, there were 6.2 fatal injuries per full time equivalent employee for workers in fire fighting, fire prevention and law enforcement. (A breakout for police officers in the field was not provided.) This compares to 15.0 for grounds maintenance, 25.3 for fishing, farming, and forestry work, 14.7 for drivers and air transportation workers, and 16.1 for construction supervisors, just to name a few. Also see pages 19-20, https://www.bls.gov/iif/oshwc/cfoi/cfch0014.pdf. This agency also reports that Patrol officer fatalities are primarily due to vehicle accident. For data concerning police shootings, generally, see https://www.washingtonpost.com/graphics/national/police-shootings-2017/ and https://www.theguardian.com/us-news/series/counted-us-police-killings. According to an article in US News and World Report (9/29/2016), between 2001 and 2015 the absolute number of black homicide victims exceeded that of white victims. Strikingly, in the US census data for 2015, there were nearly six times as many whites in the US population as blacks. What a wonderful letter. Thanks for sharing your thoughts in the service on Sunday and today. I plan to share this link with many friends. Bless you, Phyllis! Folks who want to put blogposts on facebook can copy the web address and paste it into a facebook post along with comments. Facebook normally combs the post for images and creates a very nice visual arrangement in the post. Laurie, to say you have a way with words would be an understatement. Fabulous essay, thank you! Moving and powerfully worded! Thanks for sharing!